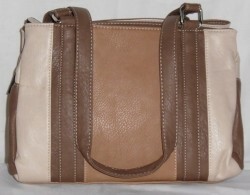 A twin handle Faux Leather handbag. There are three top zipped compartments. The middle compartment has one inner zip pocket and two open pouch pockets.